There was fierce opposition to the Reform Movement, so it never really took a permanent hold in these two countries. The Jesuits in Italy, and especially the Spanish Inquisition, were particularly adamant in their opposition to Reformed ideas. The Dominican monk Savonarola (1452-1498) could be considered, to some extent, to be a precursor of Luther. In Florence he advocated austerity in the practice of religion and the removal of any pictures in places of worship. However, his influence was short lived – he ended up burnt at the stake. In the XVIth century the ideas of the Reform Movement spread quickly. Many movements sprang up which were inspired by humanism : the most well-known, most powerful of these was spiritualism, led by Juan de Valdès, a Spaniard exiled in Italy. Venice opened its doors wide to the Reform Movement, with the University of Padua, which was close by, becoming the main centre where followers of all religious persuasions could engage in dialogue with each other. In the duchy of Ferrara, Renée, the daughter of Louis XII, and a follower of Lefèvre d’Etaples, married Duke Hercule d’Este, who had joined the Reform Movement ; she welcomed into her home both Clément Marot and Calvin himself, just before he returned to Geneva. But the support she gave to the Reformers led to her being accused of heresy and summoned before the court of Inquisition. When her husband died, she returned to France. 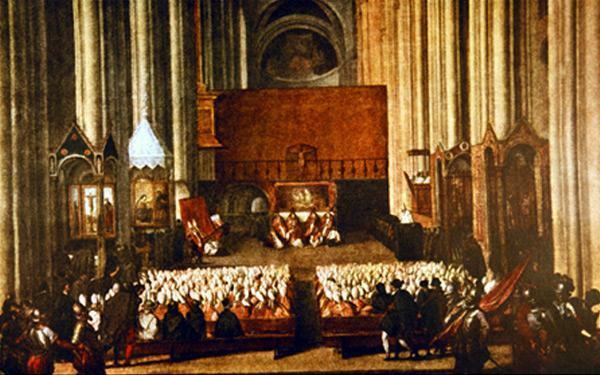 The Reform Movement in Italy suffered several blows at the hands of the Inquisition and after the Council of Trent (1545-1563) it disappeared completely. Some people, for example numerous inhabitants of Lucques, felt they had to emigrate to Geneva, the Swiss cantons or Germany. However, the Piedmont valleys, to the west of Turin, (also known as the “Waldensian valleys” after the early reformer Pierre Valdo) were an exception. These valleys had been obtained permission from their ruler, Duke Emmanuel-Philibert of Savoy, to hold public religious services which were different to that of their prince and of the majority of the population (the Treaty of Cavour, signed in June 1561). But apart from this unusual case, the Reform Movement was never really able to take a proper hold anywhere in Italy. It can be said that Protestantism has never really existed in Spain. Even though Erasmus had a certain influence on Spanish spirituality, when Juan de Valdes tried to circulate a translation of Luther’s work, he did not make much headway. The Inquisition reacted violently, and after the great “book-burnings” of Valladolid and Seville (1559-1562), during the reign of Charles V, the “Reformed tradition” disappeared completely.